While I was out digging holes in the garden, Noel went to IKEA to get the rest of our cabinet doors, so we could finish up that job. 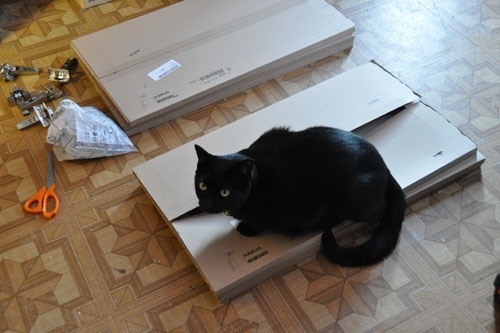 With some feline assistance, he systematically worked his way across the installed carcasses. For some reason the instructions had told us to put the pins that tie the cabinets together into just the wrong spot, so he had to move all of those, then install the back of the hinge. 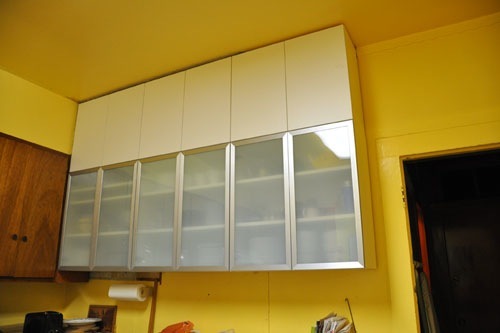 IKEA cabinets use European style hidden hinges, obviously. They make for a nice clean look and let the door open wider than some of the hinge styles you see in the US. 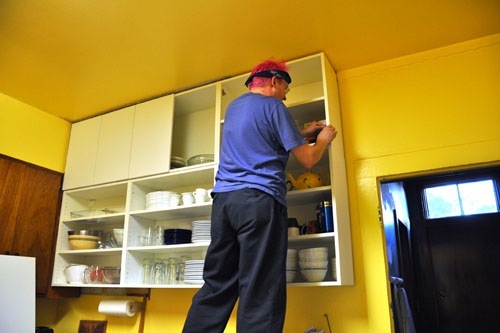 As you can see, Noel spent a bunch of time this last week putting things in these cabinets, both from the original cabinet and from other parts of the kitchen. So far this means we go to where the thing used to be kept and stare blankly before locating it in its new home. And here are the finished cabinets. We will eventually get some knobs or door pulls of some sort, and we're discussing putting some under-cabinet lighting in, but it's looking pretty nice right now. There's even a little palimpsest moment in the lower left, where you can see the marks from the previous cabinet on the wall. Not to be picky, but this sentence really scared me: With some feline assistance, he systematically worked his way across the installed carcasses. It took me a few seconds to figure it out. Thanks for the laugh! :) and thanks for sharing!